Sweet potato muffins are a delicious way get sweet potatoes into your family's diet. Try our healthier versions for a sweet treat packed with nutrition. 1 medium sized sweet potato peeled and cut into cubes. 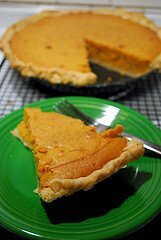 Note: The batter may also be prepared using 1 1/2 cups whole-wheat pastry flour for extra fiber. If using whole wheat flour, add another 1/4 cup applesauce to the batter. Preheat the oven to 350 degrees fahrenheit. Coat a 12 cup muffin tin with cooking spray. Then add the sweet potato chunks to a pot of boiling water and boil for about 15 minutes. Afterwards, drain and place into a blender of food processor, or mash well with a fork. In a large bowl, mix together the flour, baking powder, cinnamon, nutmeg, and salt. In another bowl, whisk together the egg, applesauce, Splenda, canola oil, and the vanilla. Add in the mashed sweet potato and mix again. Add to the flour mixture and mix until all are combined. Pour the batter evenly into the prepared muffin cups. Bake for about 15 to 17 minutes until a toothpick inserted into the muffin, comes out clean. Remove the muffins from the oven, and let them cool in the pan for 5 minutes and then turn out into a cooling rack. Serve when warm or at room temperature. 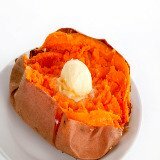 A visitor shares another healthier version for "Sweet Potato Muffins"